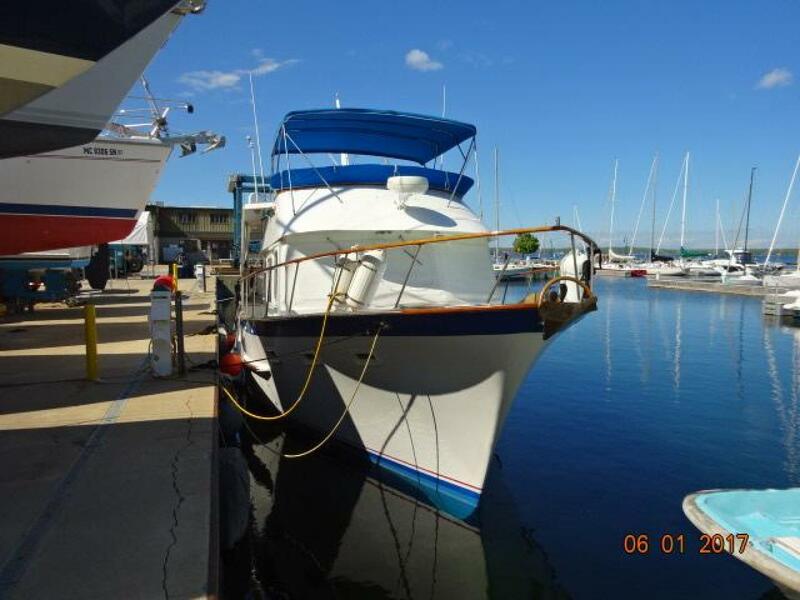 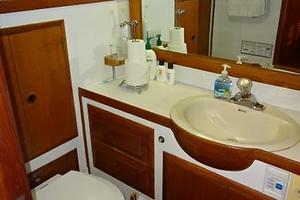 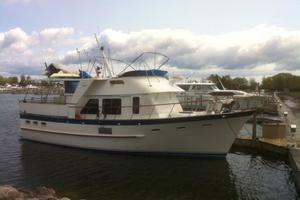 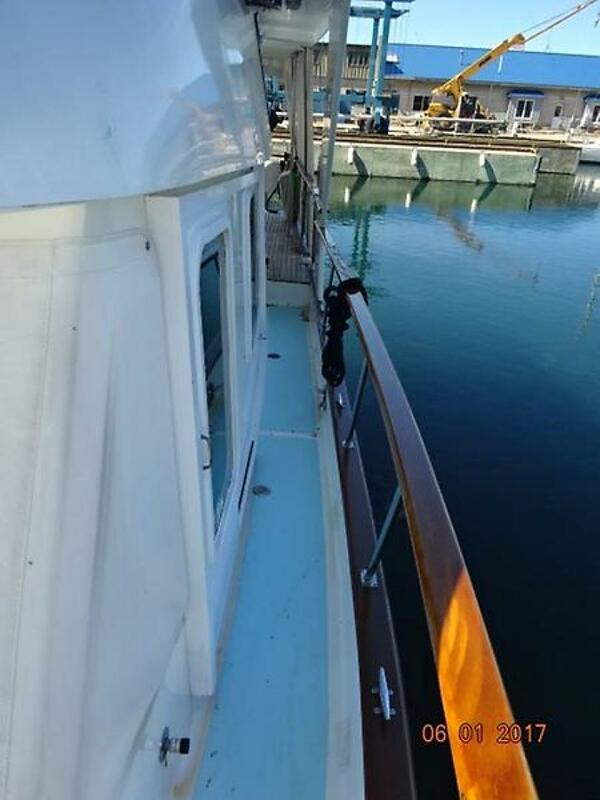 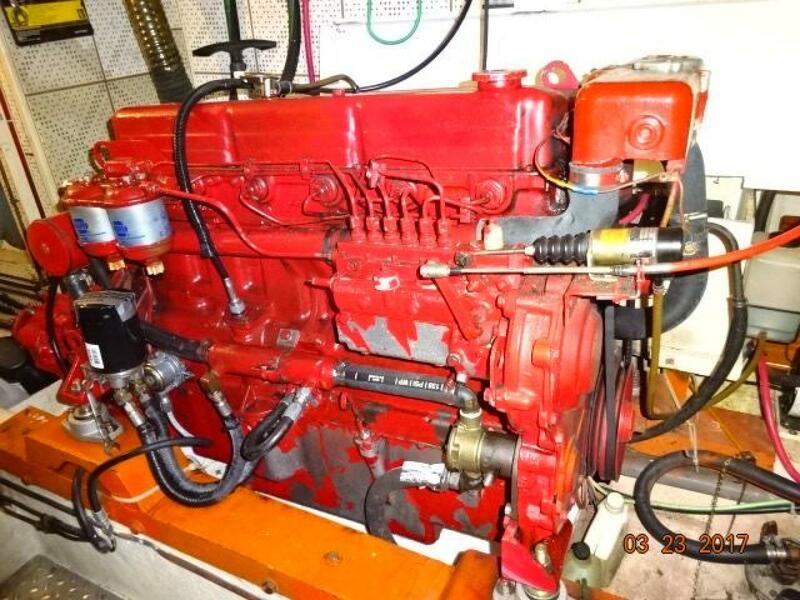 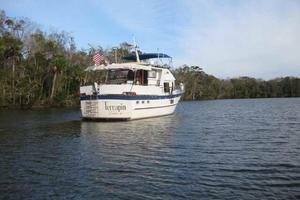 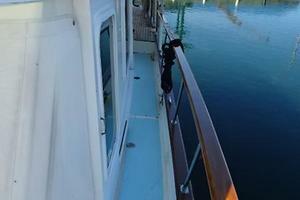 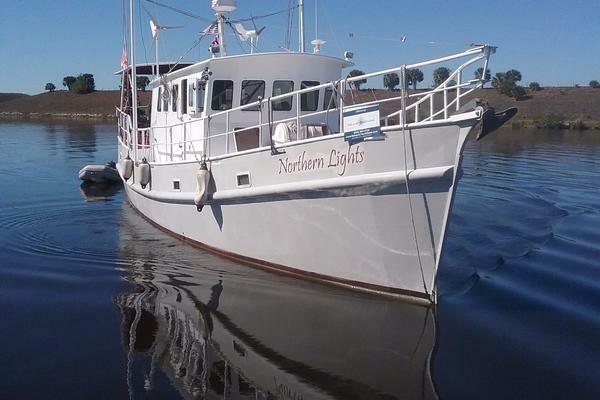 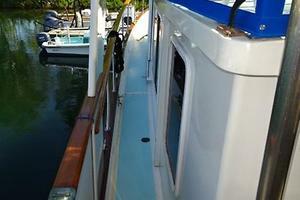 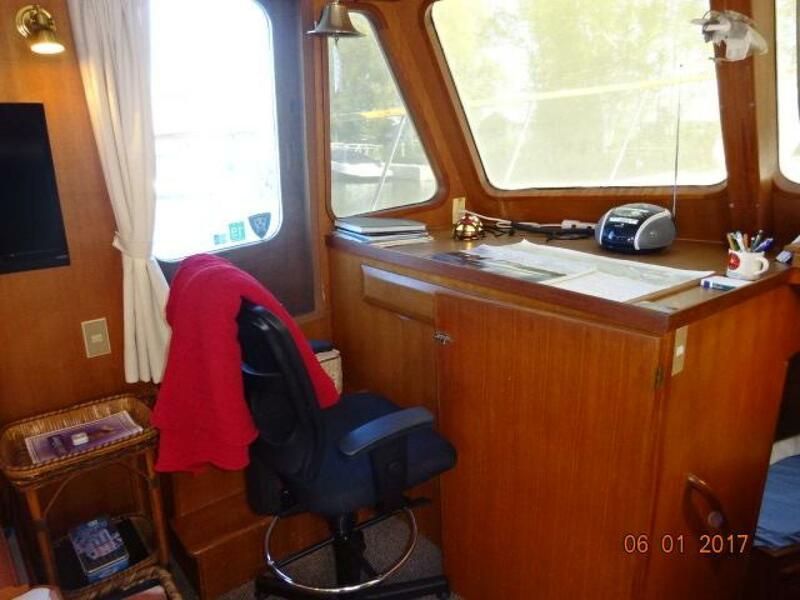 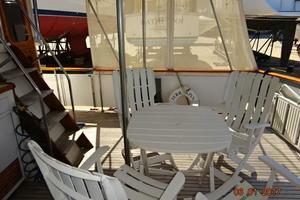 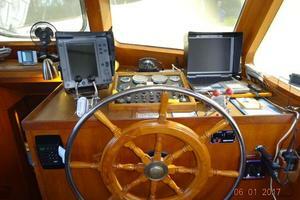 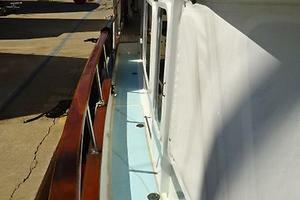 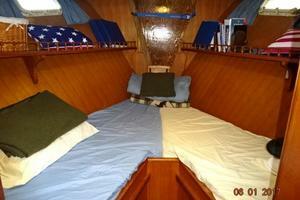 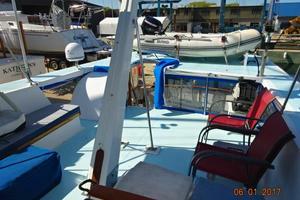 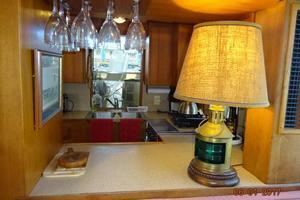 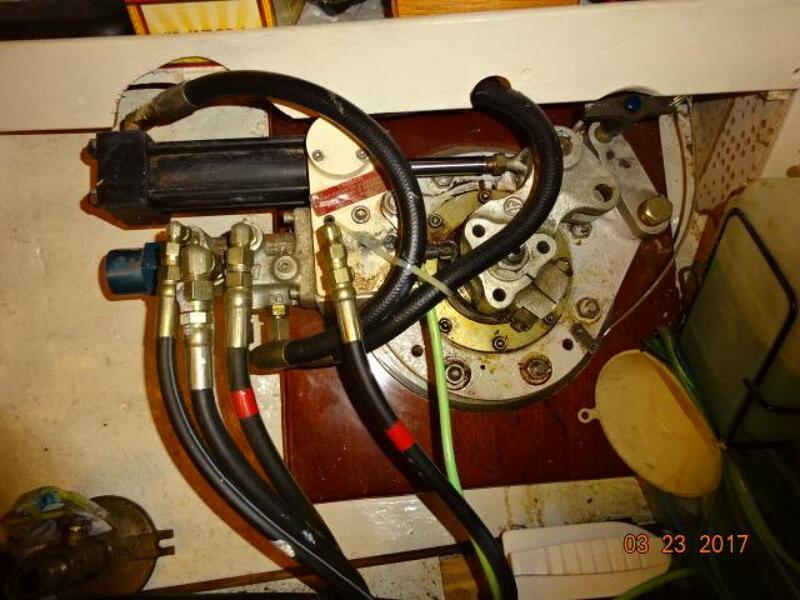 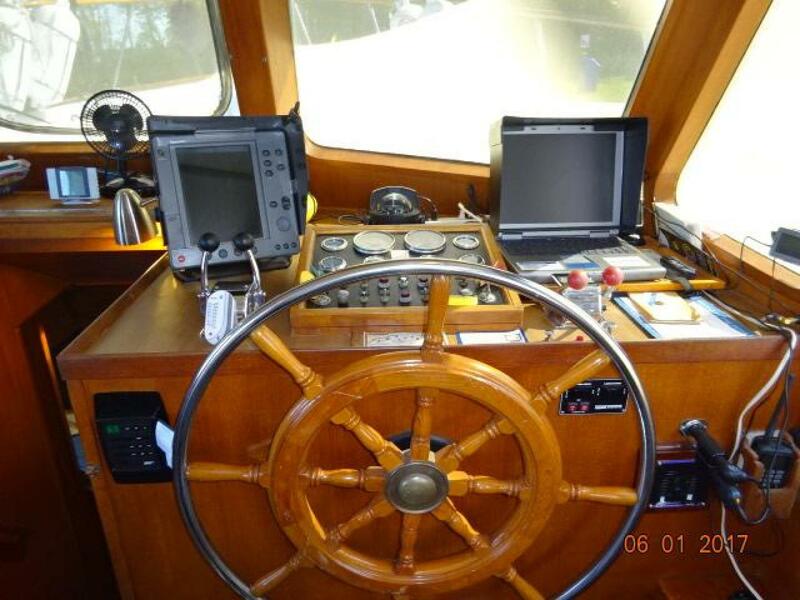 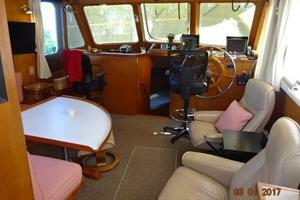 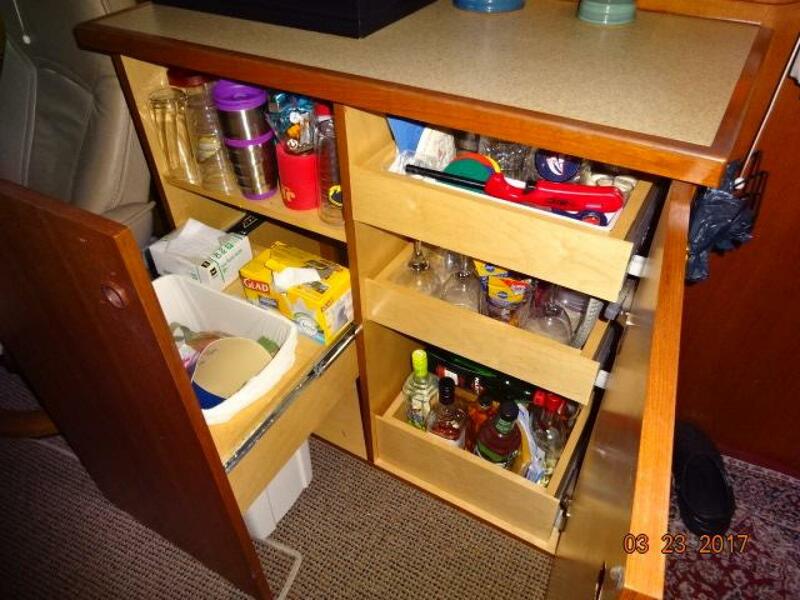 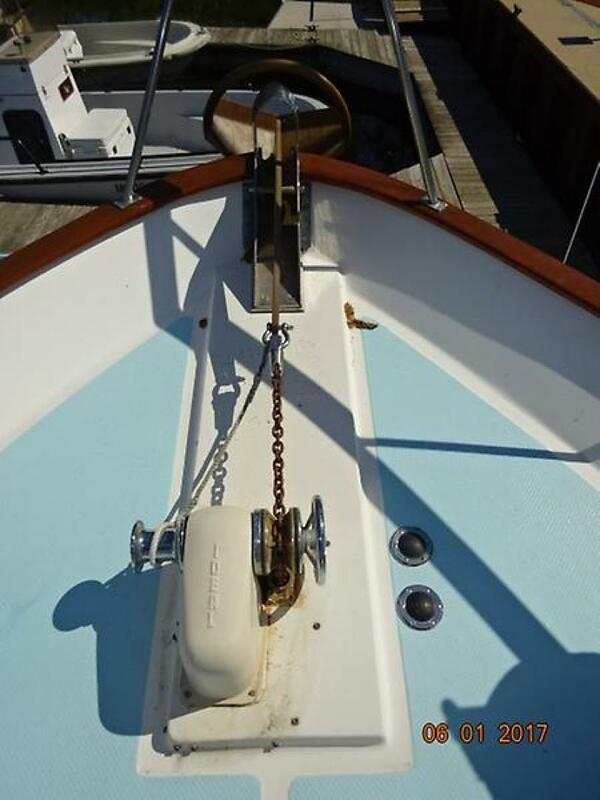 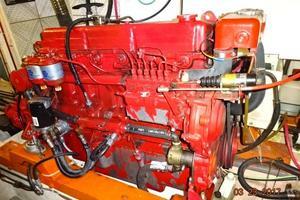 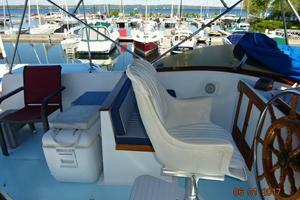 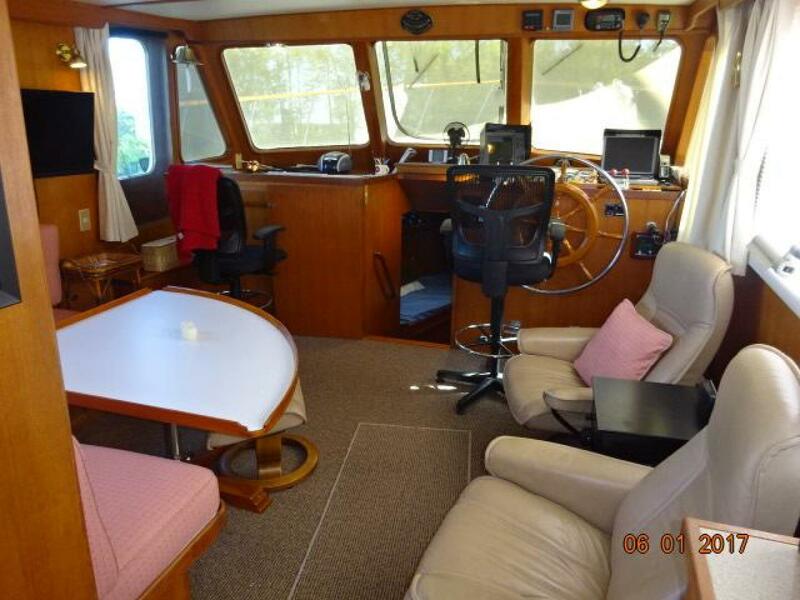 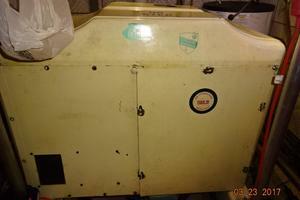 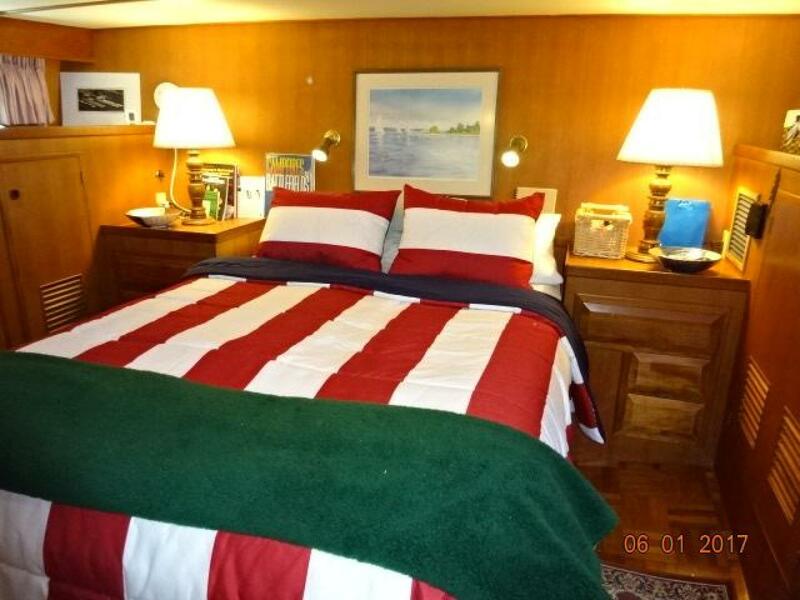 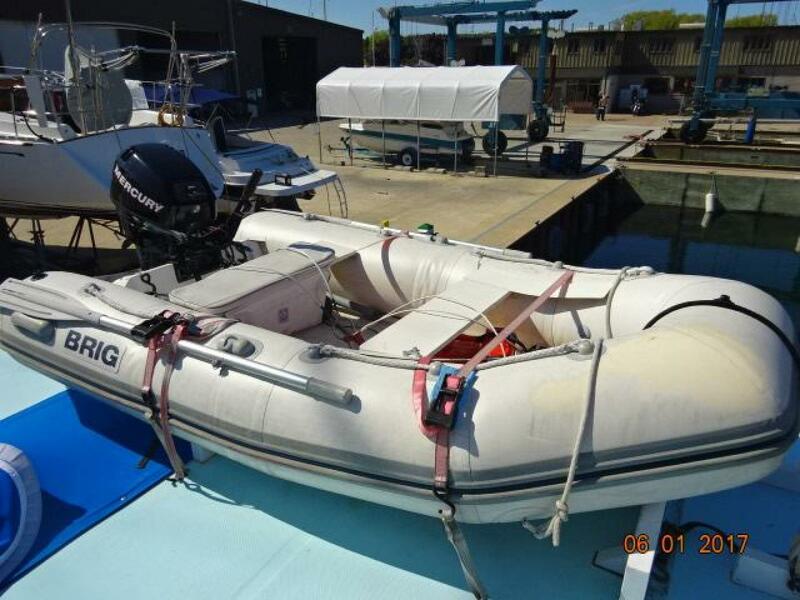 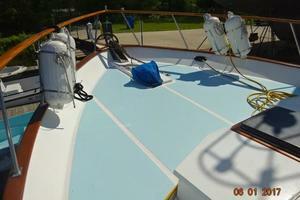 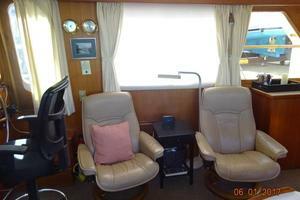 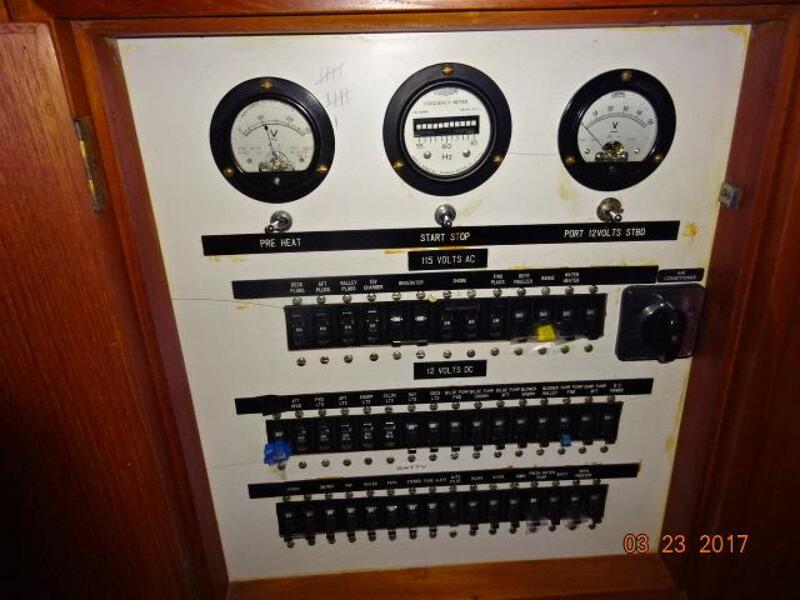 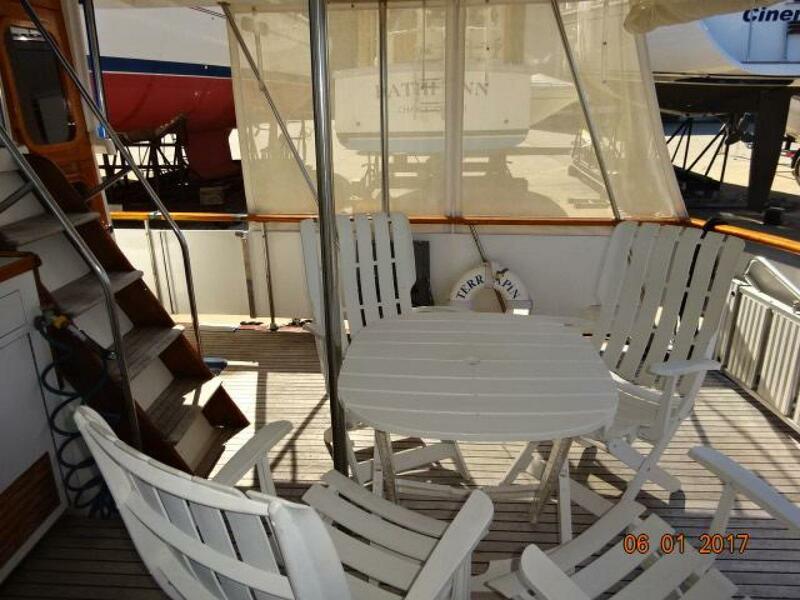 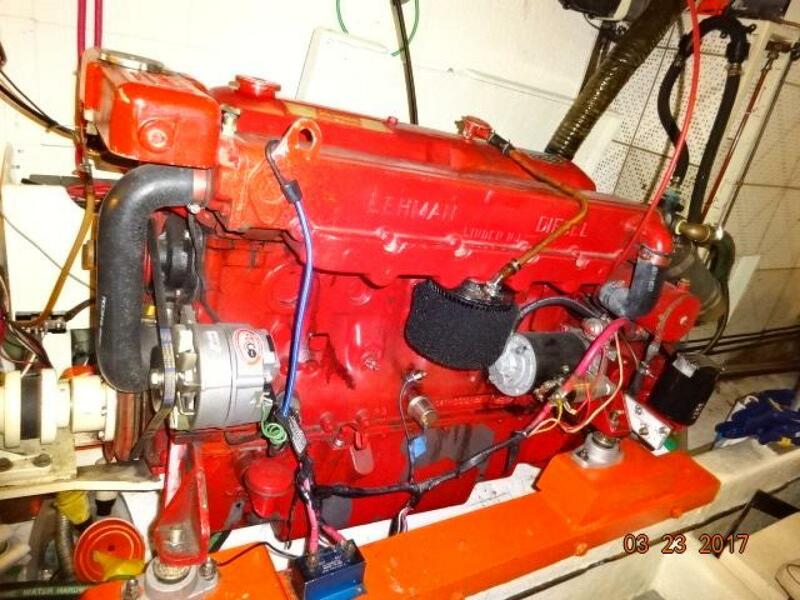 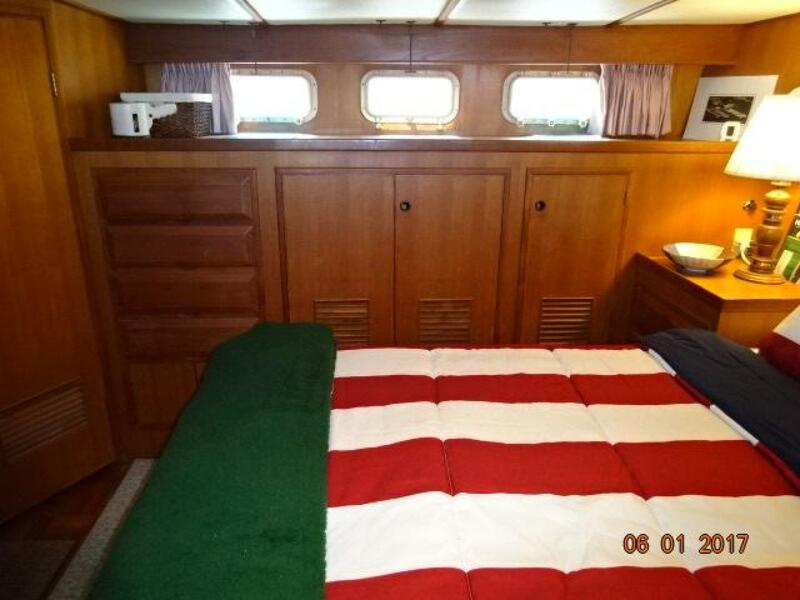 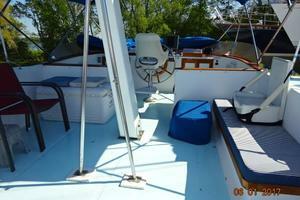 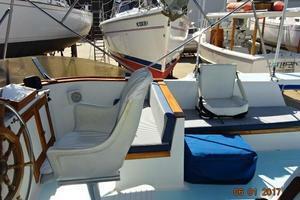 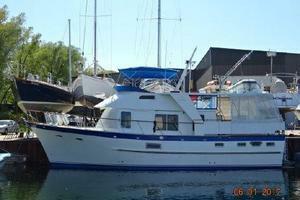 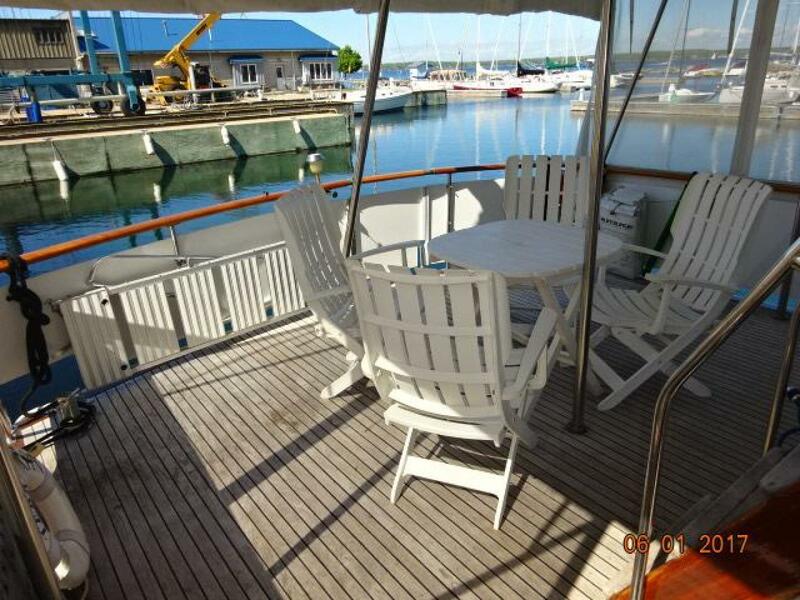 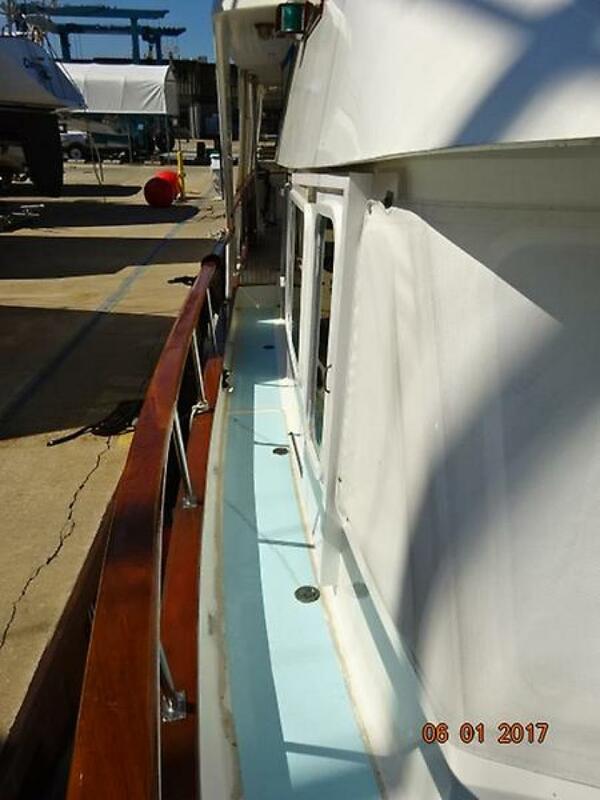 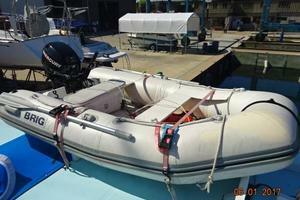 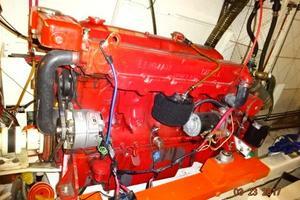 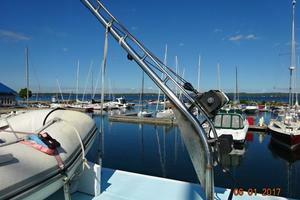 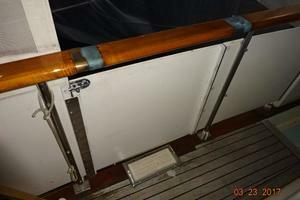 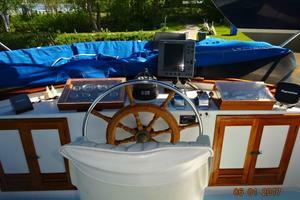 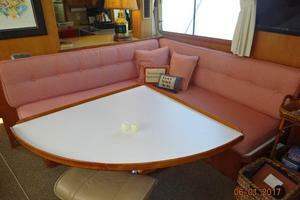 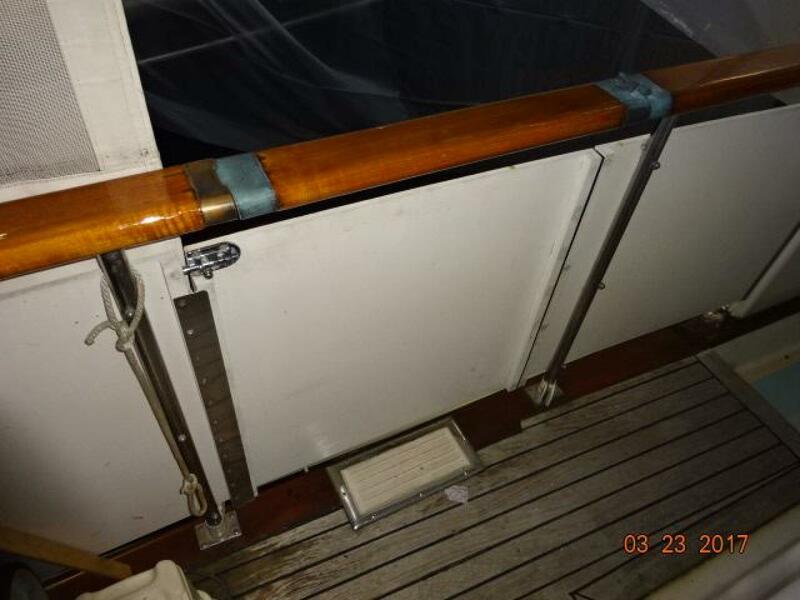 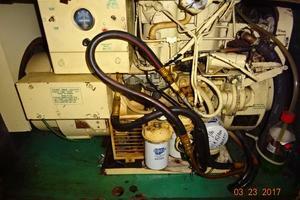 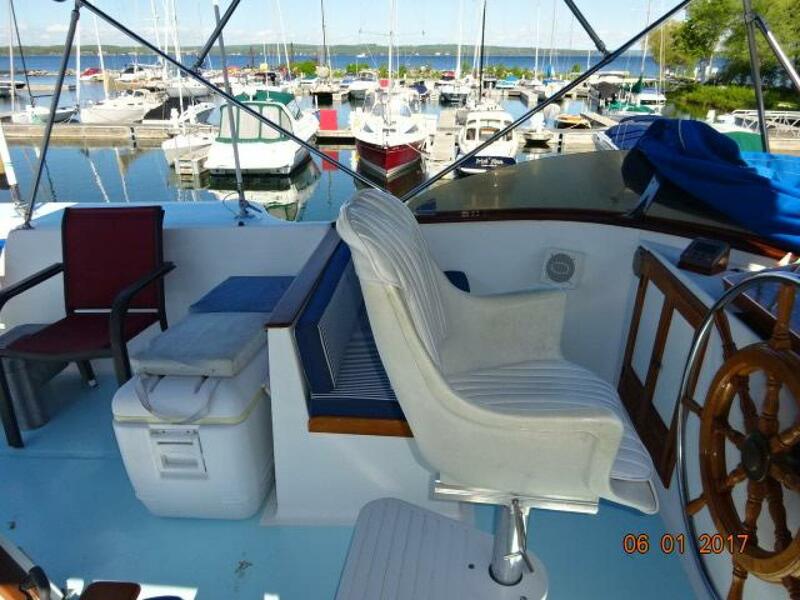 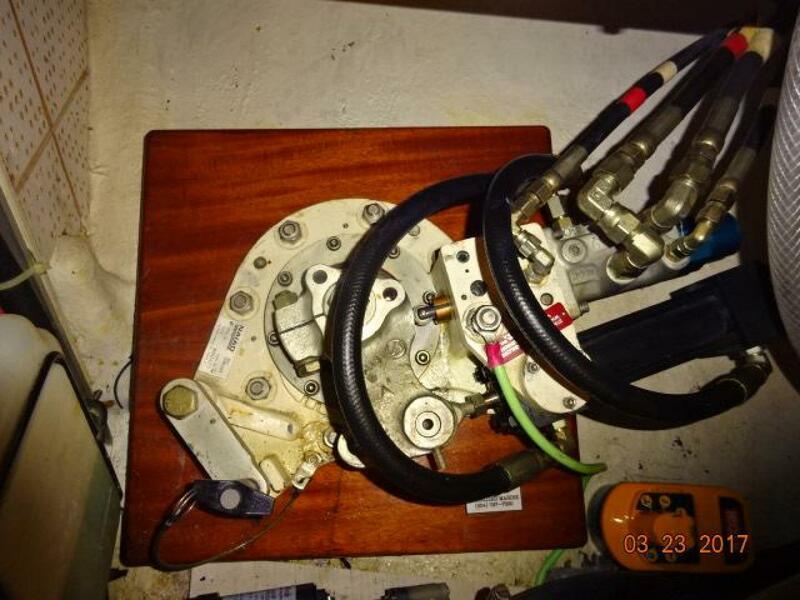 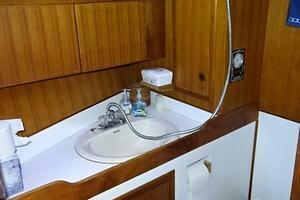 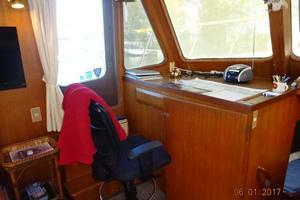 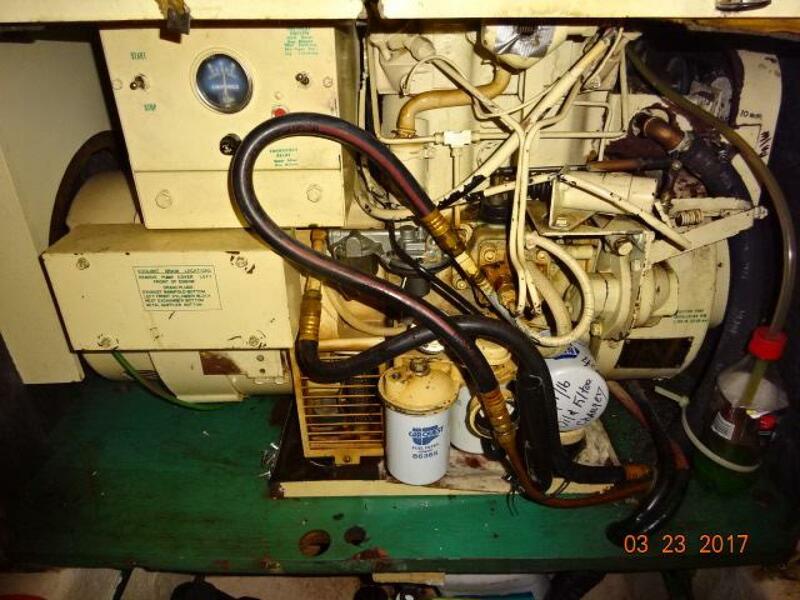 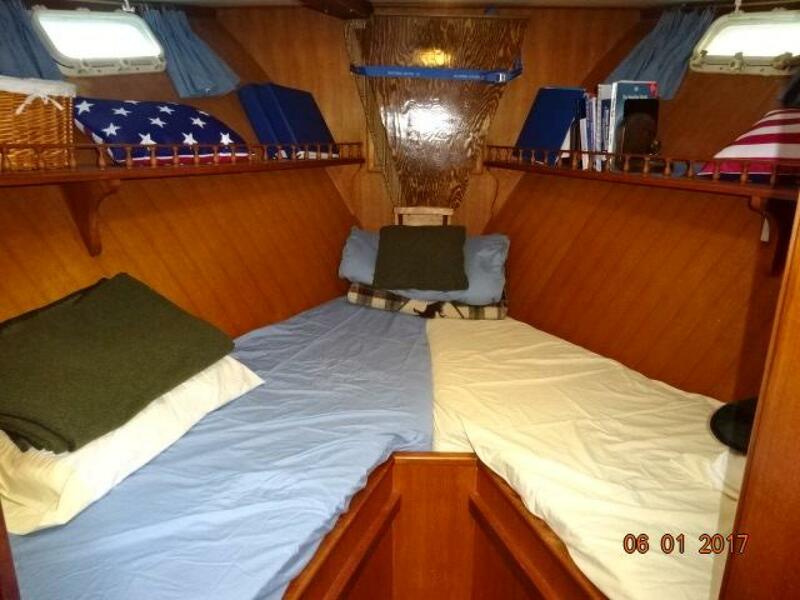 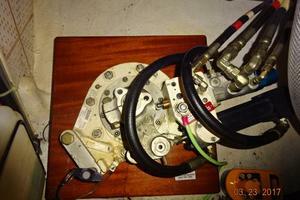 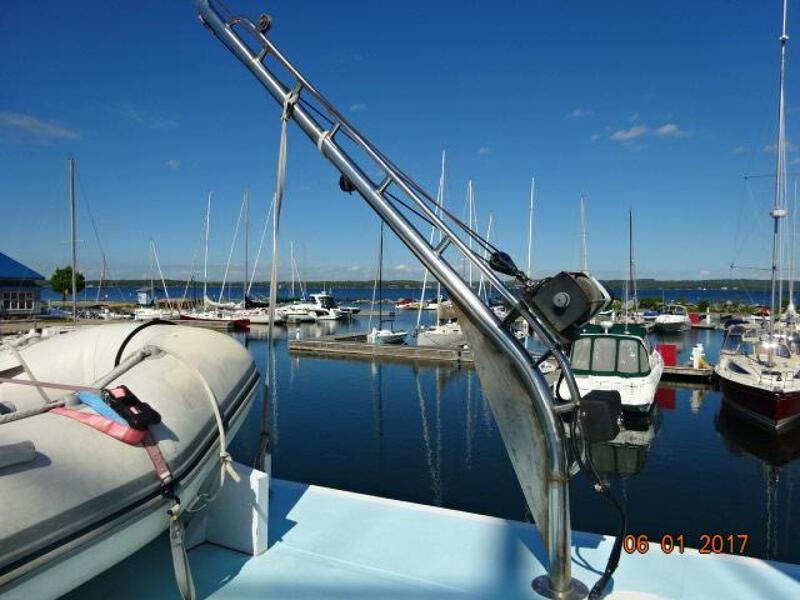 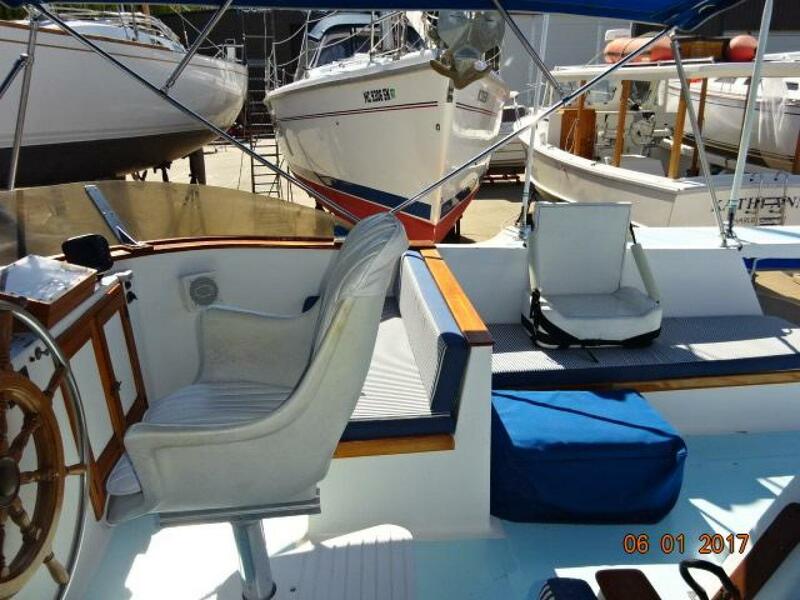 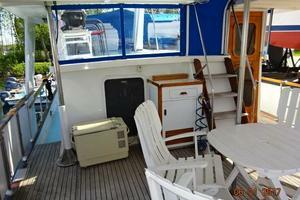 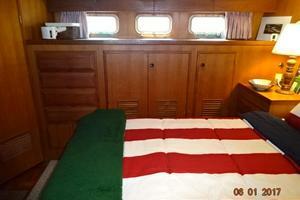 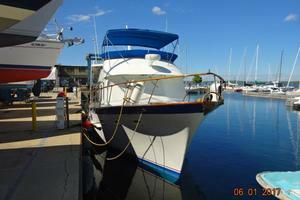 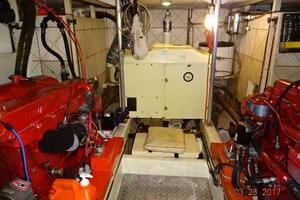 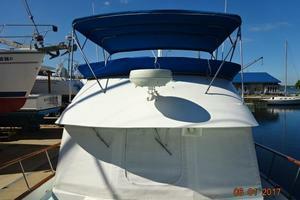 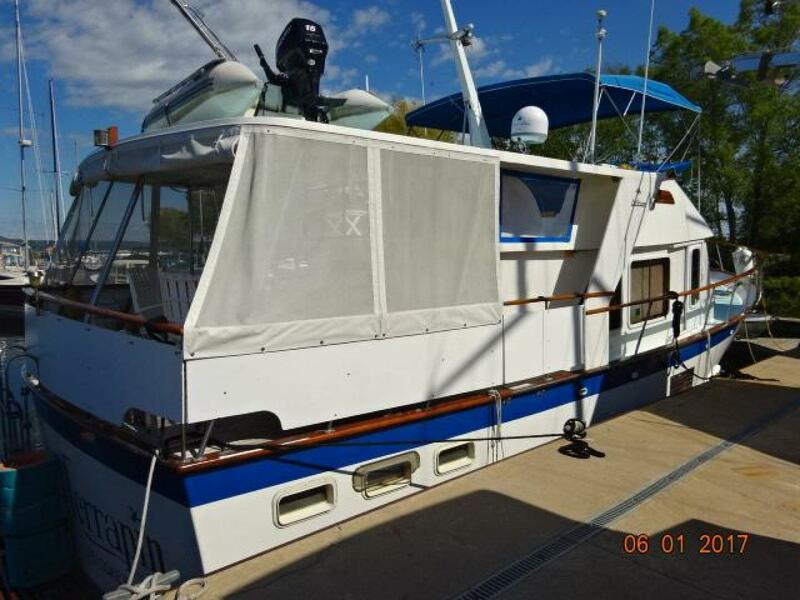 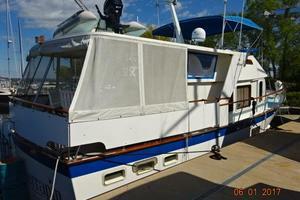 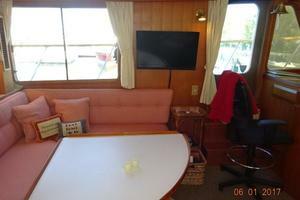 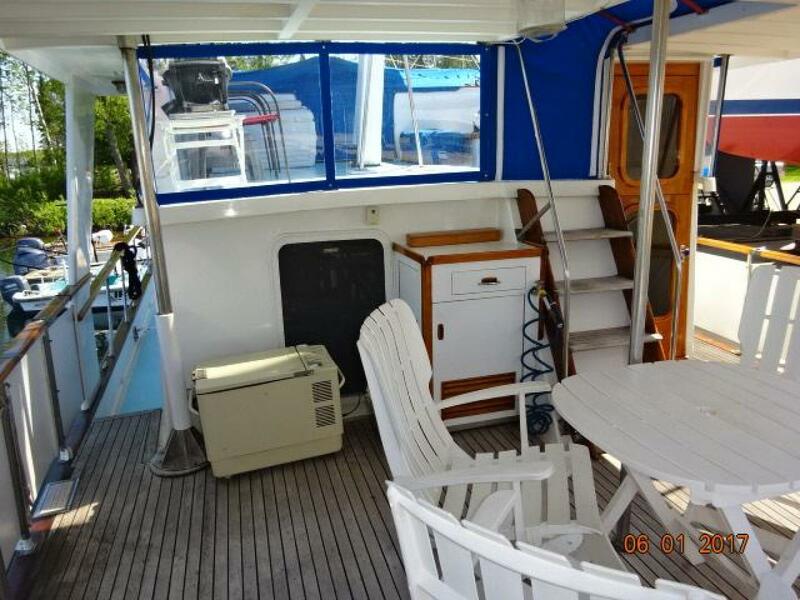 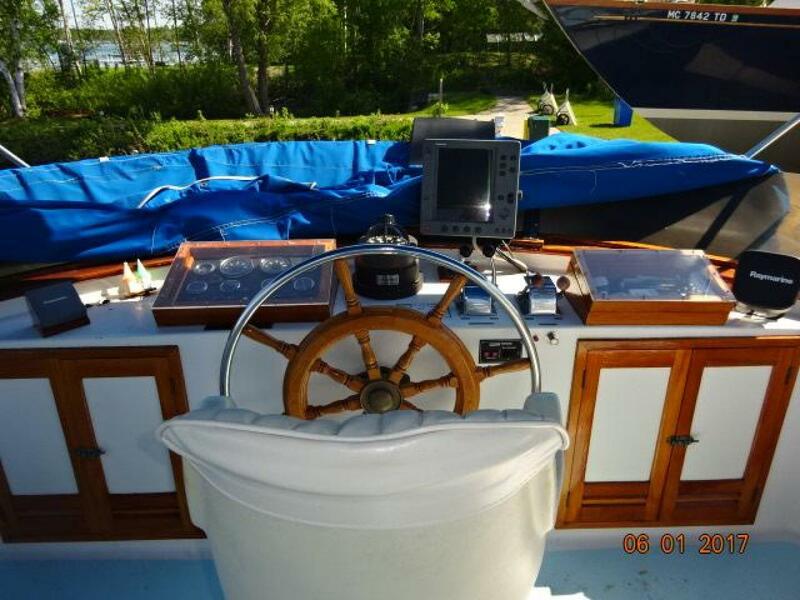 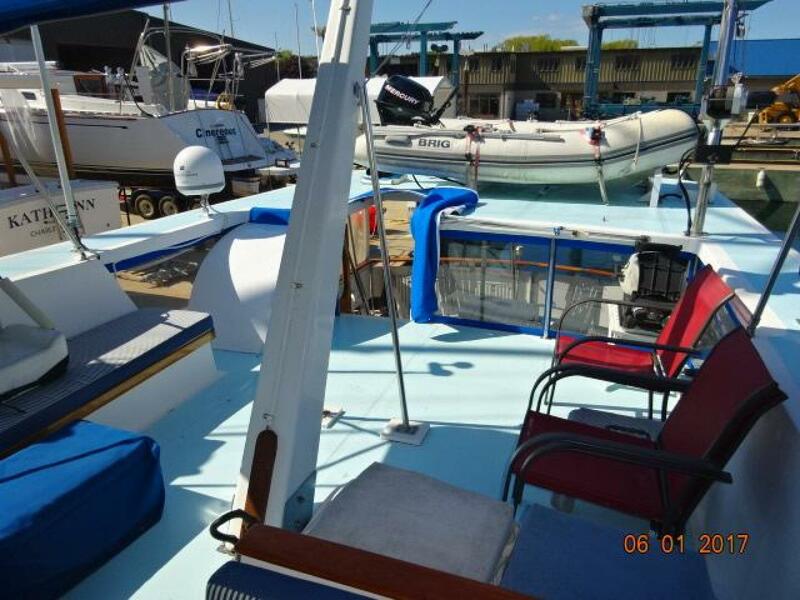 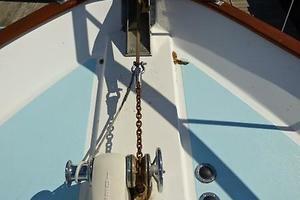 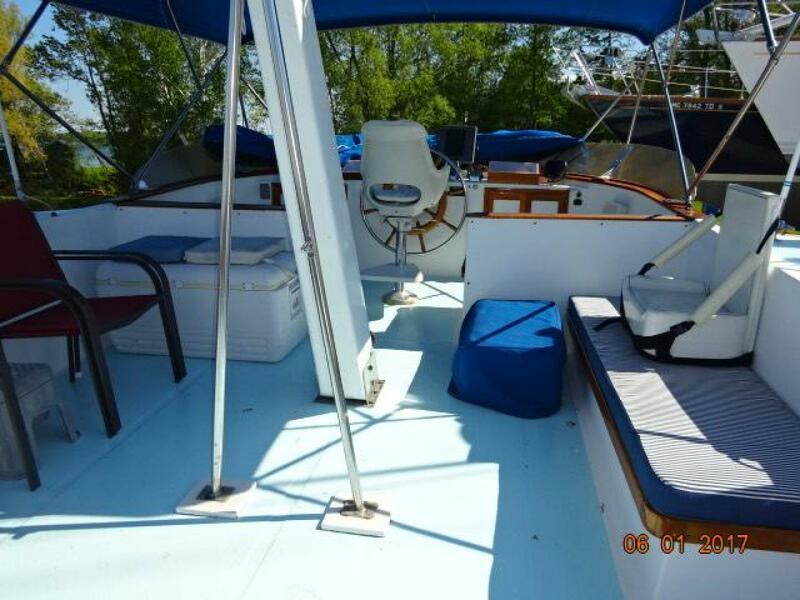 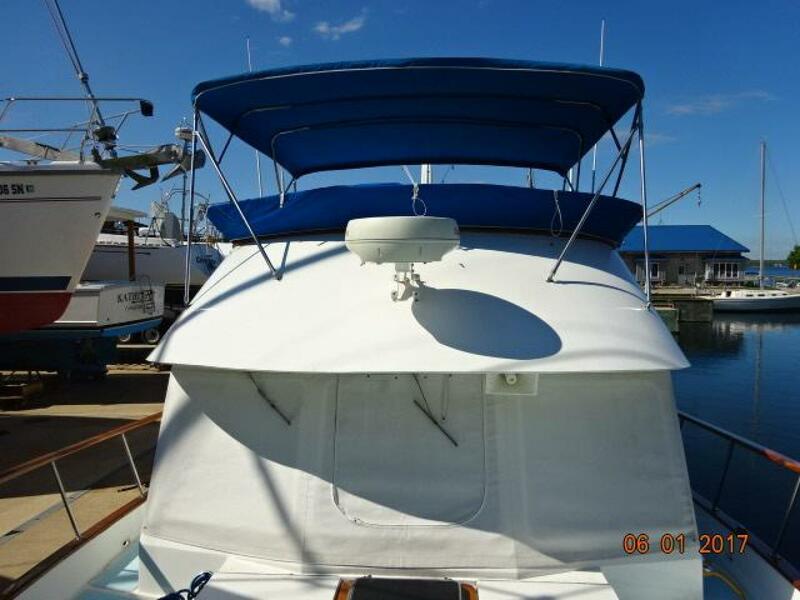 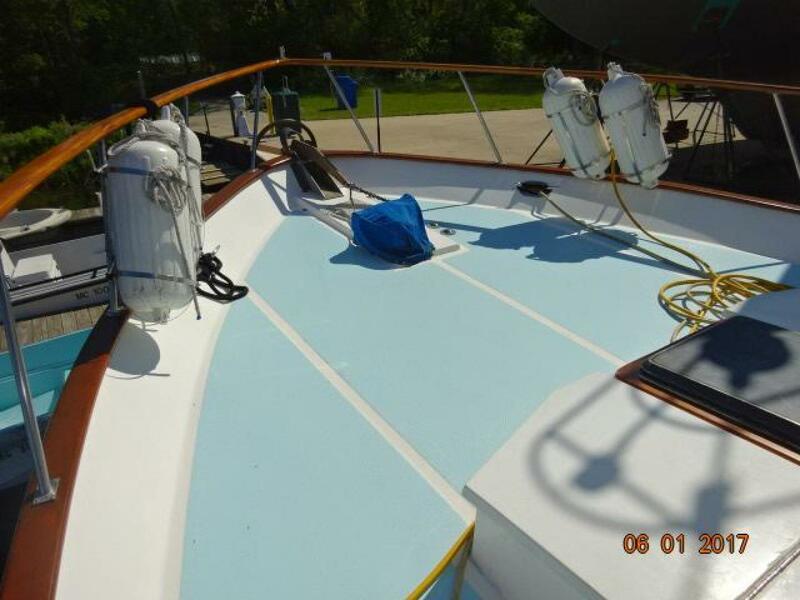 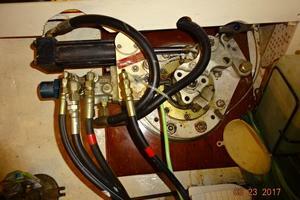 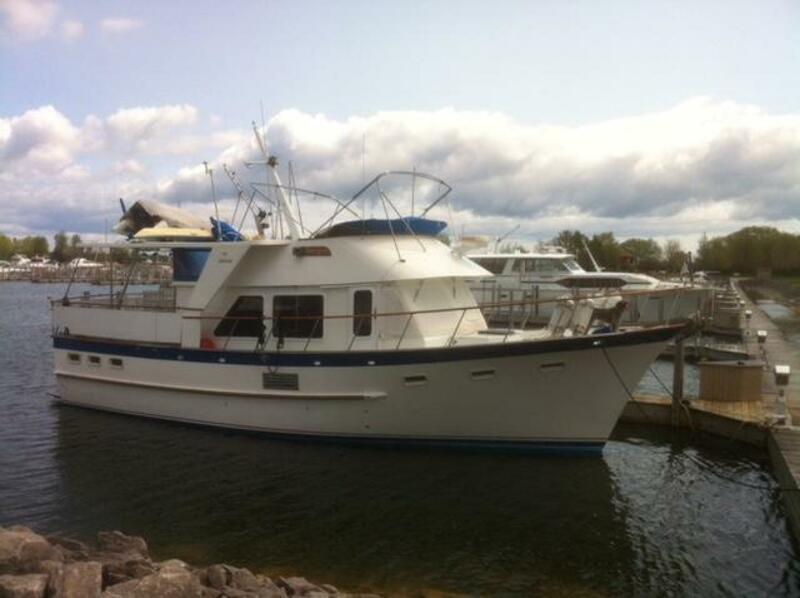 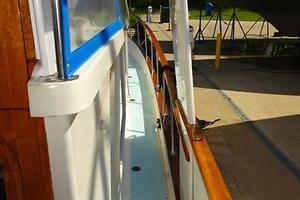 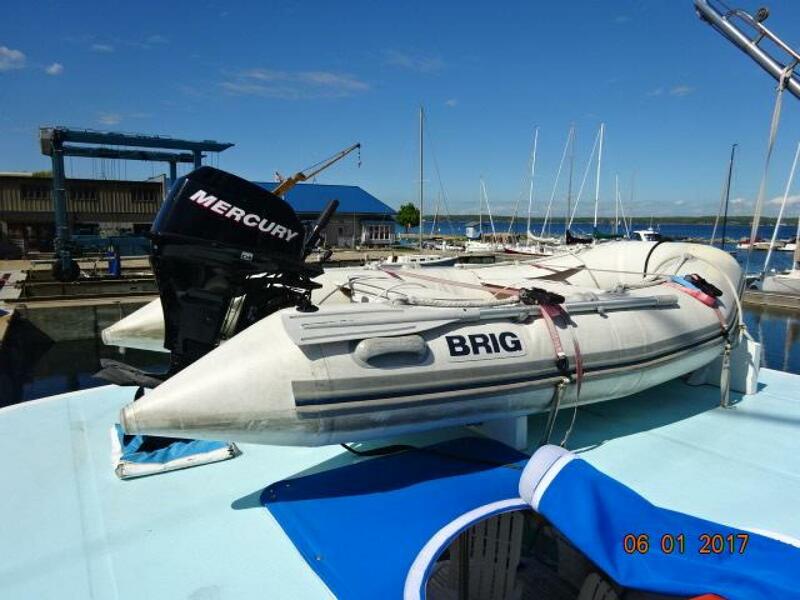 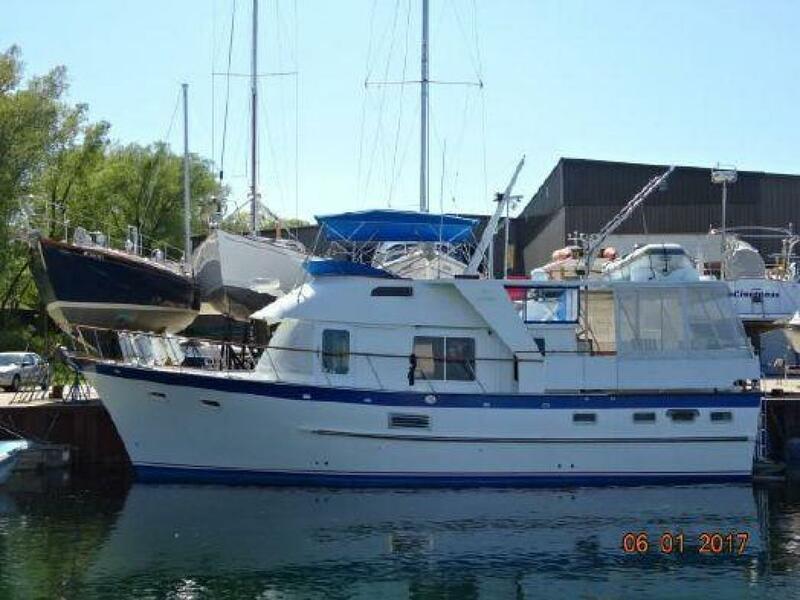 Terrapin is a classic 2 stateroom 2 head DeFever 44 Offshore Cruiser in good condition. 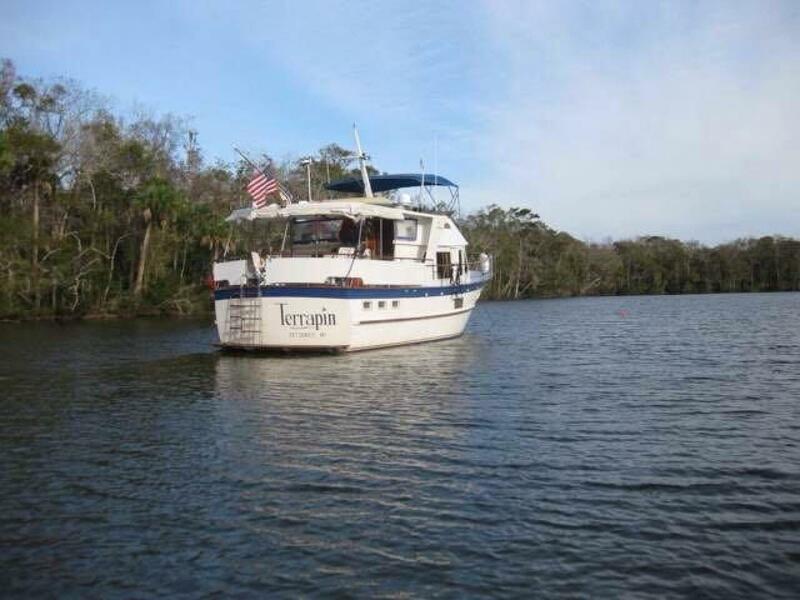 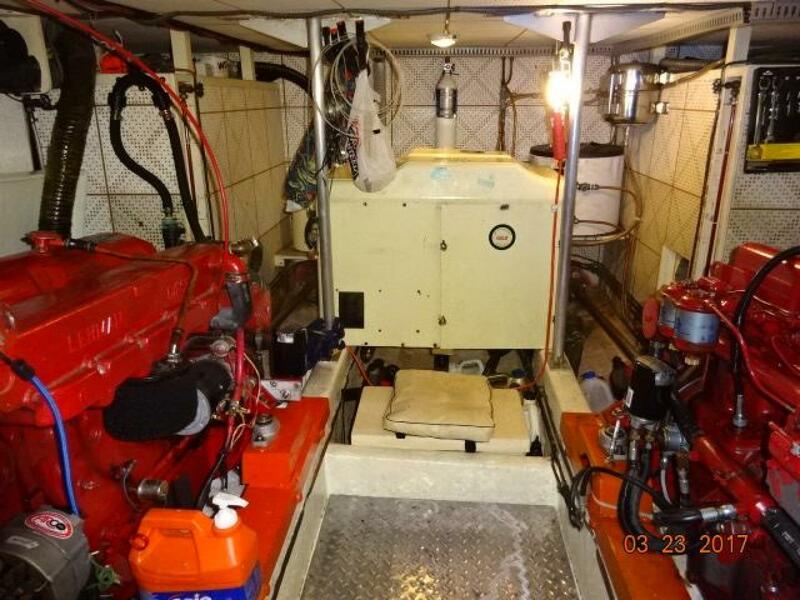 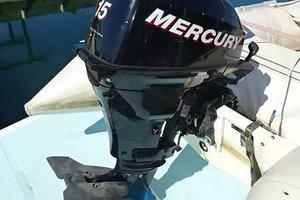 She offers twin Ford Lehman 120 hp main engines, Onan 8 kW generator, Naiad stabilizers and a KVH satellite TV system. 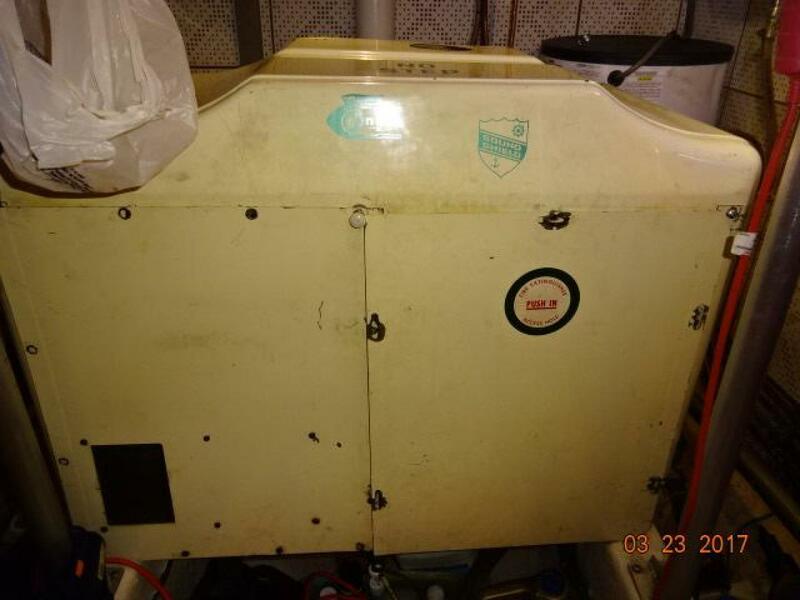 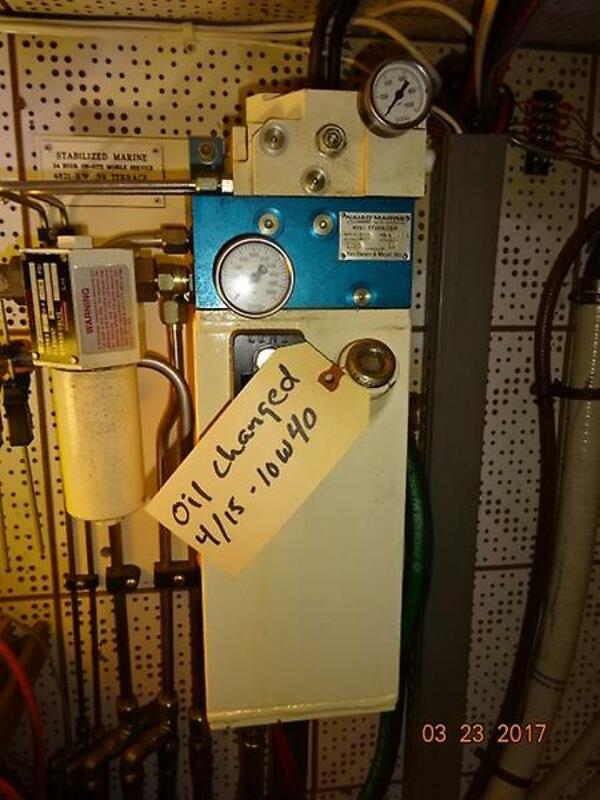 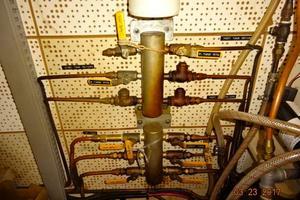 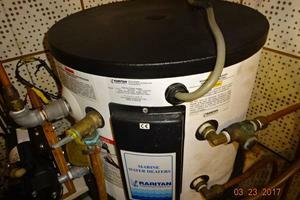 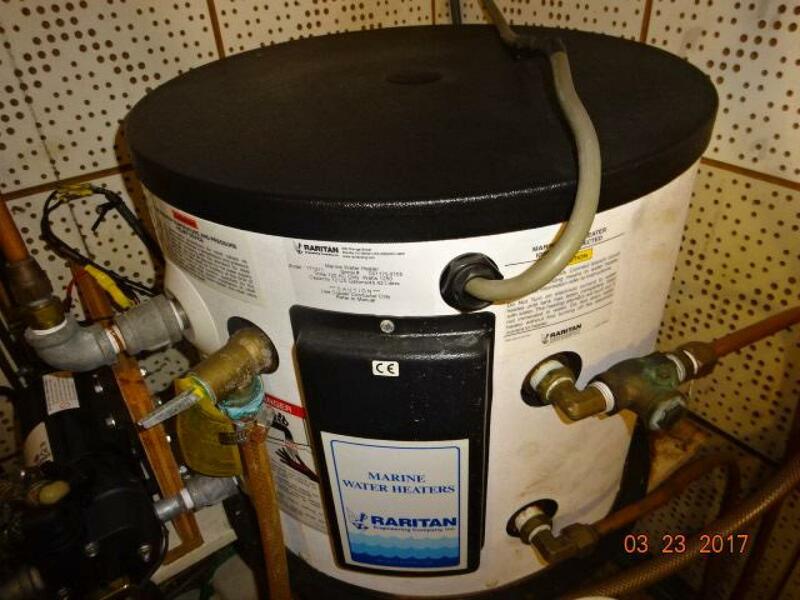 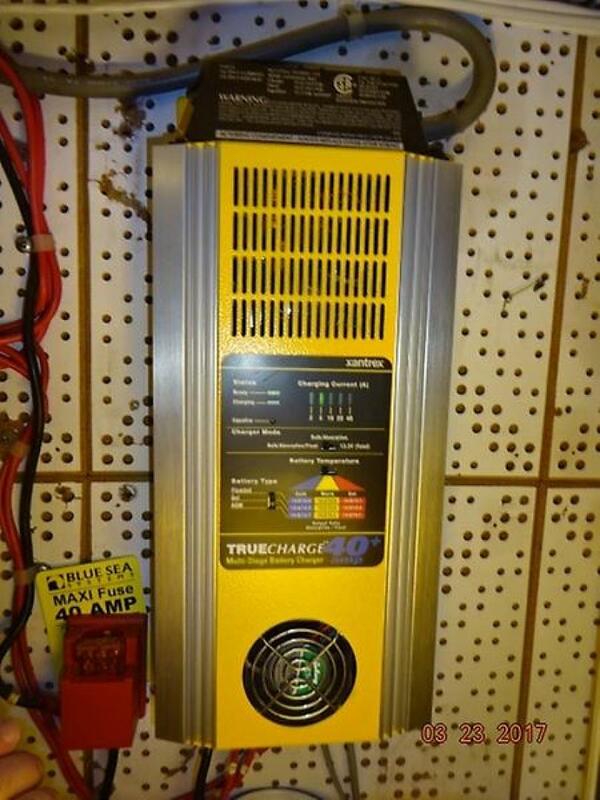 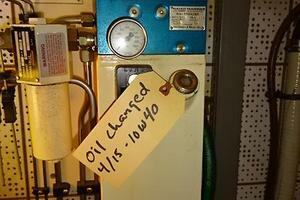 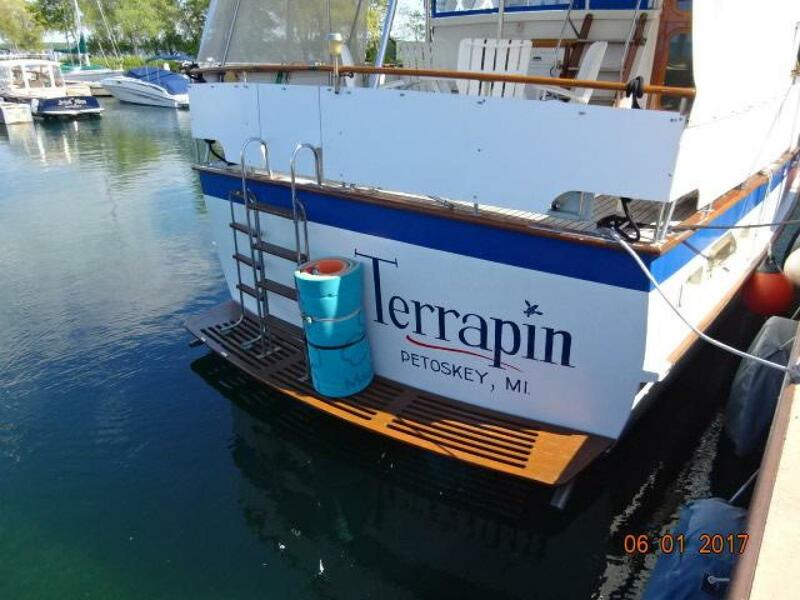 Terrapin is a Great Loop veteran, but she is fresh water based and stored each winter inside a heated building. 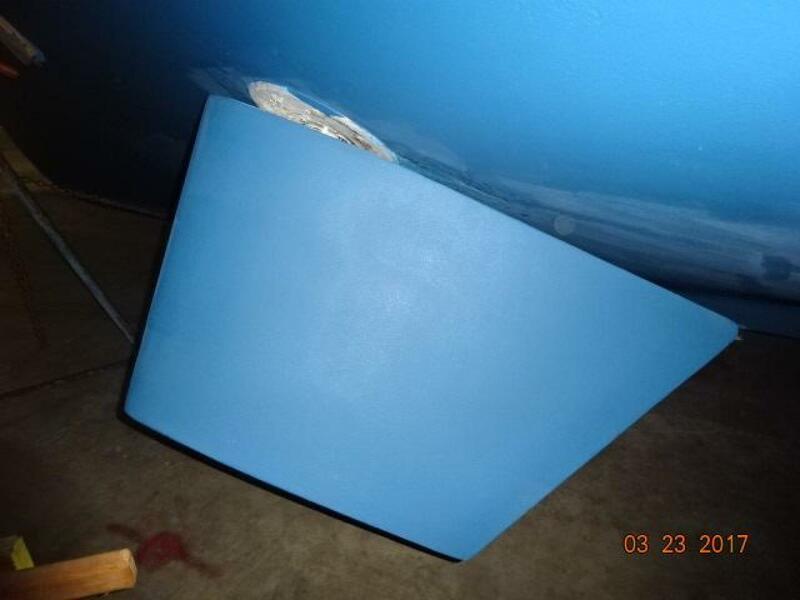 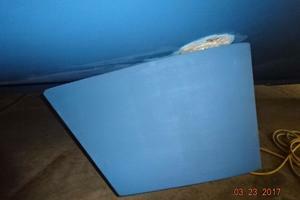 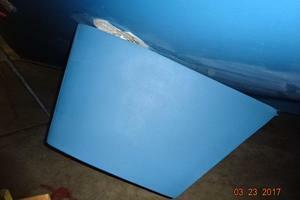 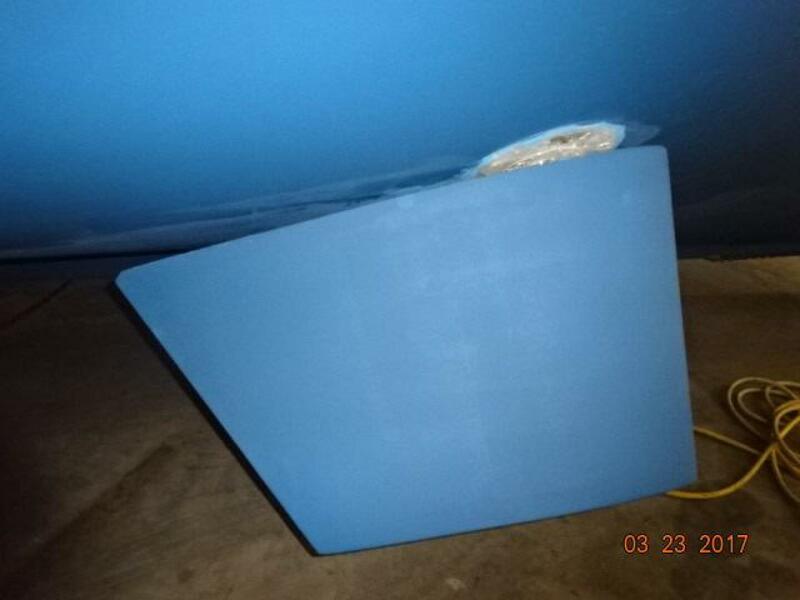 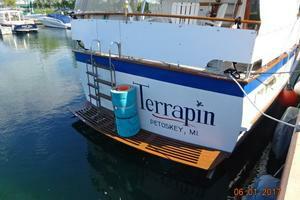 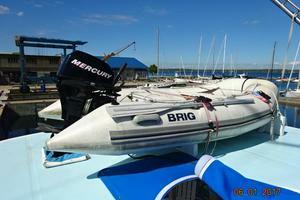 Terrapin is presently stored for the winter, but she is scheduled to be launched and detailed around late April. 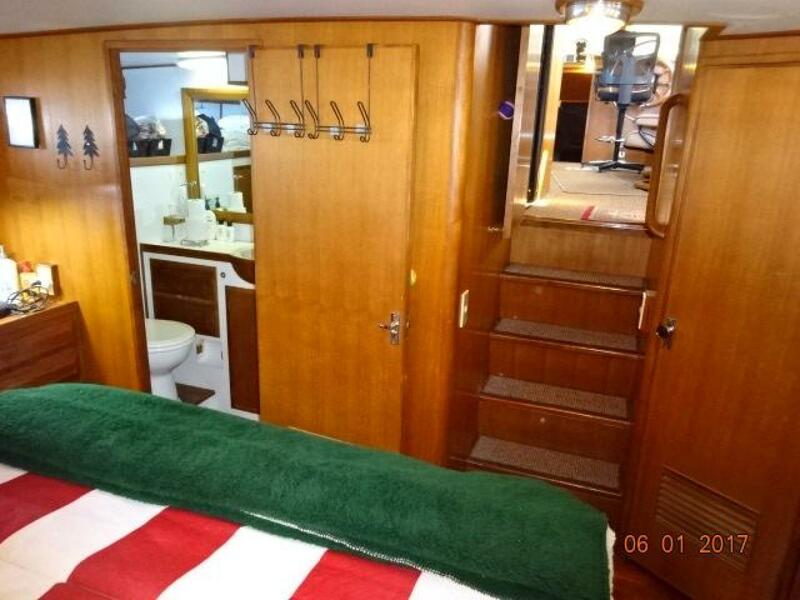 Entering the salon from the sundeck, you will find the galley to port, cabinetry to starboard, two Erkornes Stressless lounge chairs and ottoman further forward to starboard, the lower helm and side deck access door starboard forward, chart counter and drawer and a side deck access door port forward and built-in L-shaped seating with table to port. 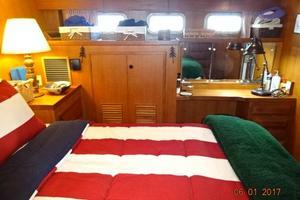 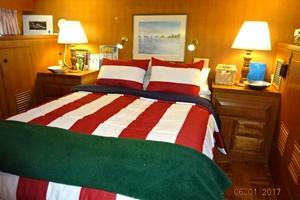 You can then walk forward to the guest stateroom and engine room access or aft to the master stateroom. 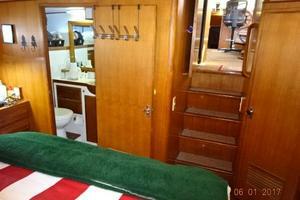 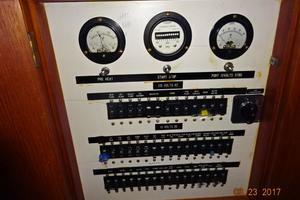 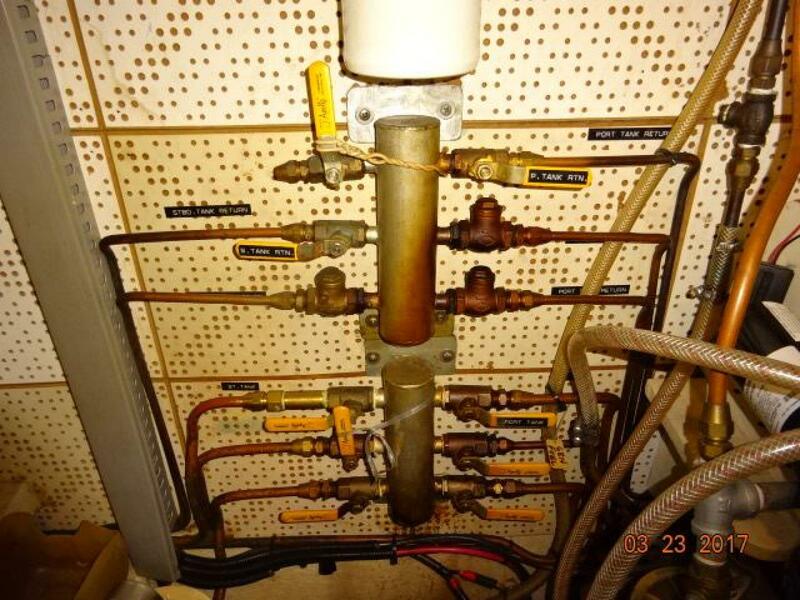 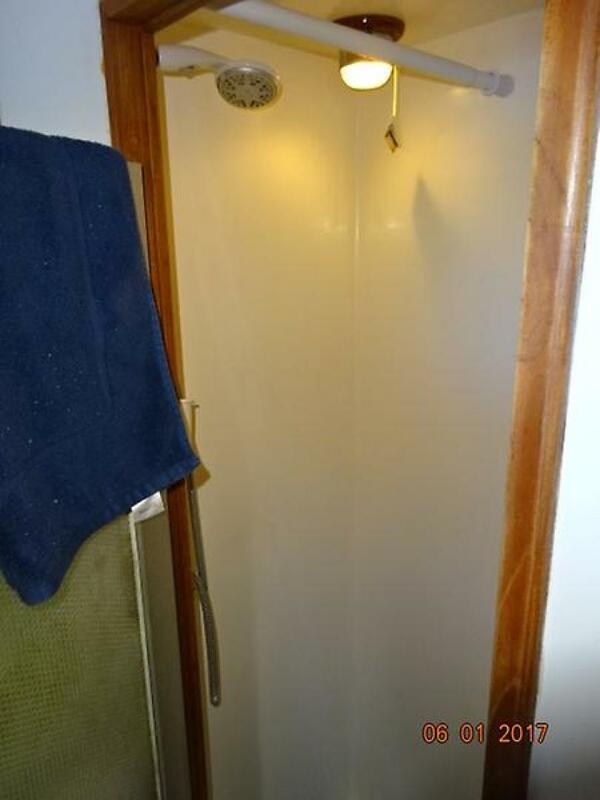 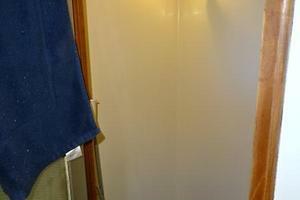 The headroom in the salon and guest stateroom is 6'8", 6'2" in the master stateroom and 5' in the engine room. 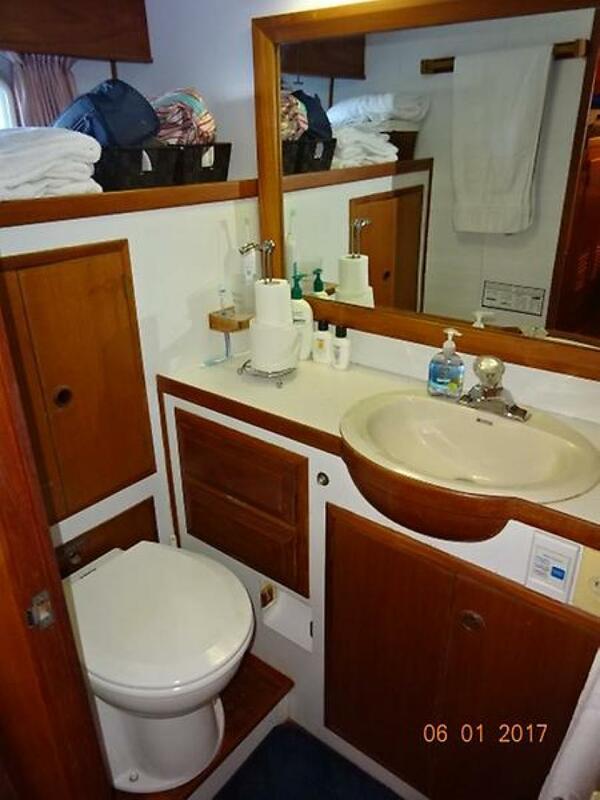 Terrapin offers a full beam master stateroom aft with ensuite head and a guest stateroom forward with a v-berth and an ensuite head. 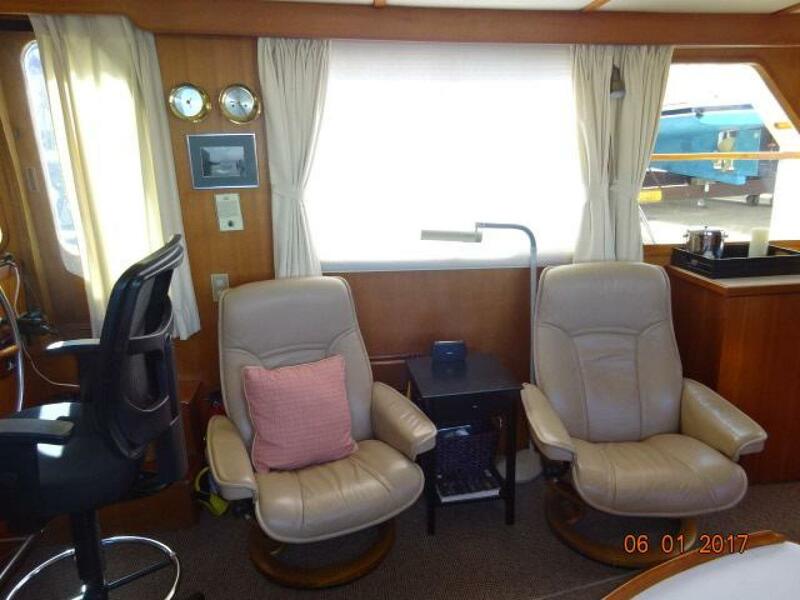 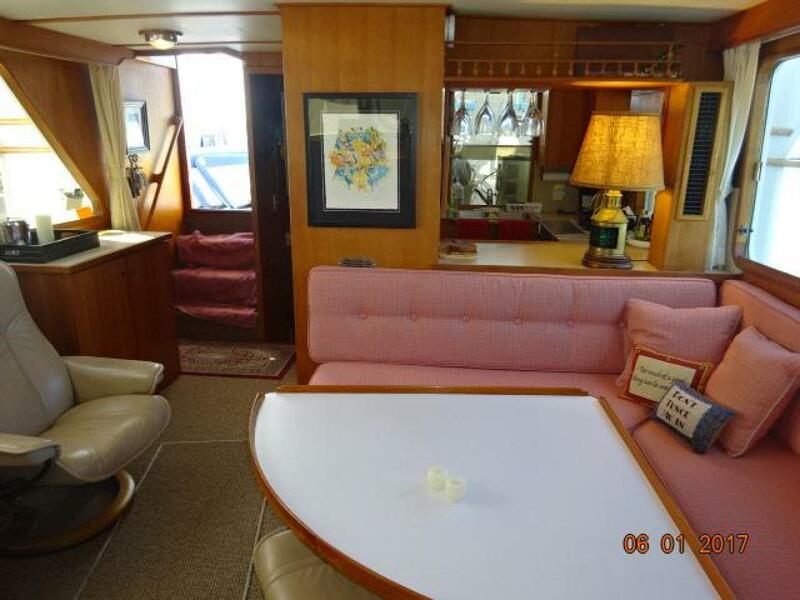 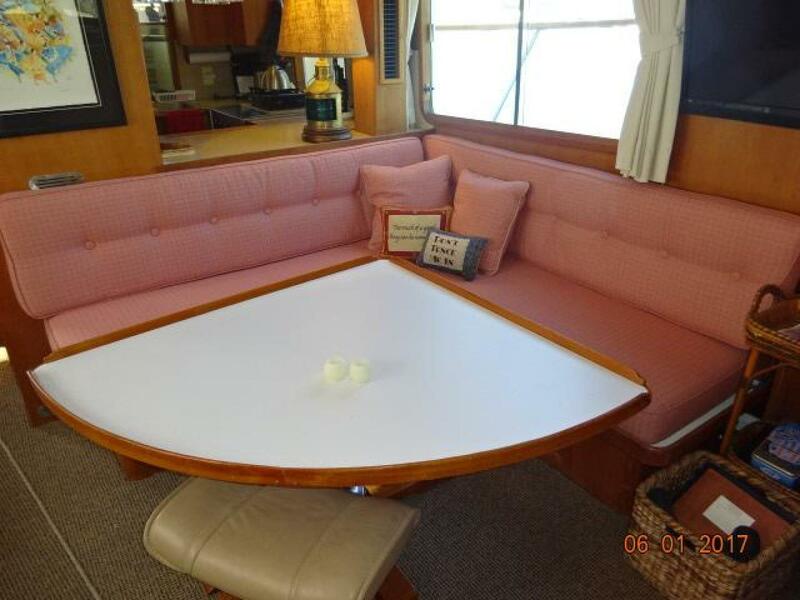 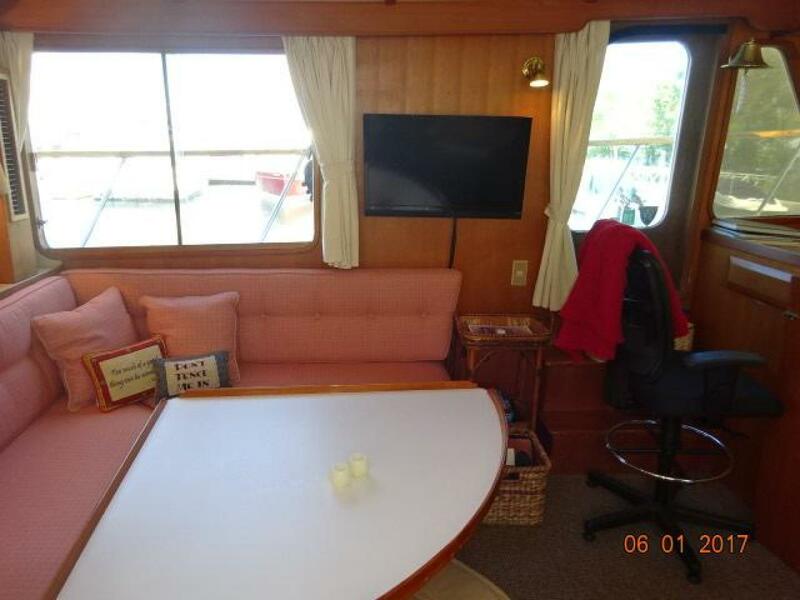 The large salon offers built-in, wrap-around seating and hi/lo table to port, side deck access door and chart counter and drawer port forward, two Erkornes Stressless lounge chairs and ottoman to starboard, side deck access door starboard forward, liquor/trash/storage cabinet starboard aft, opening side windows with curtains, screens on each side door and a Phantom roll-away screen door aft and carpet. 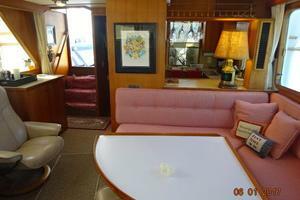 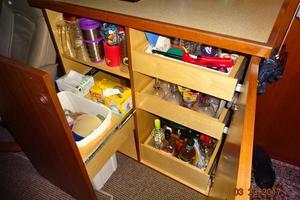 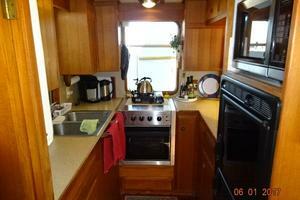 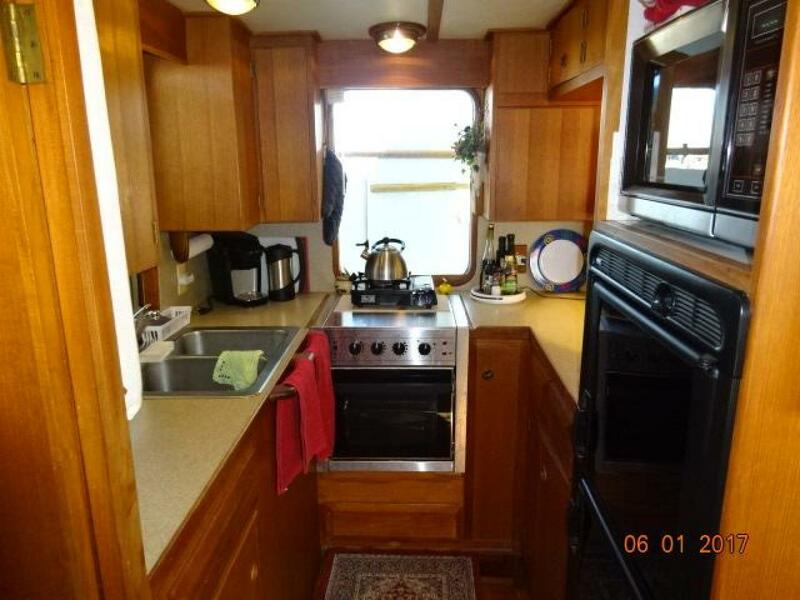 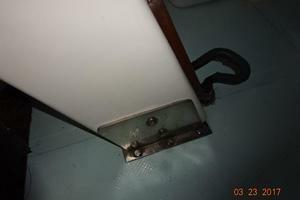 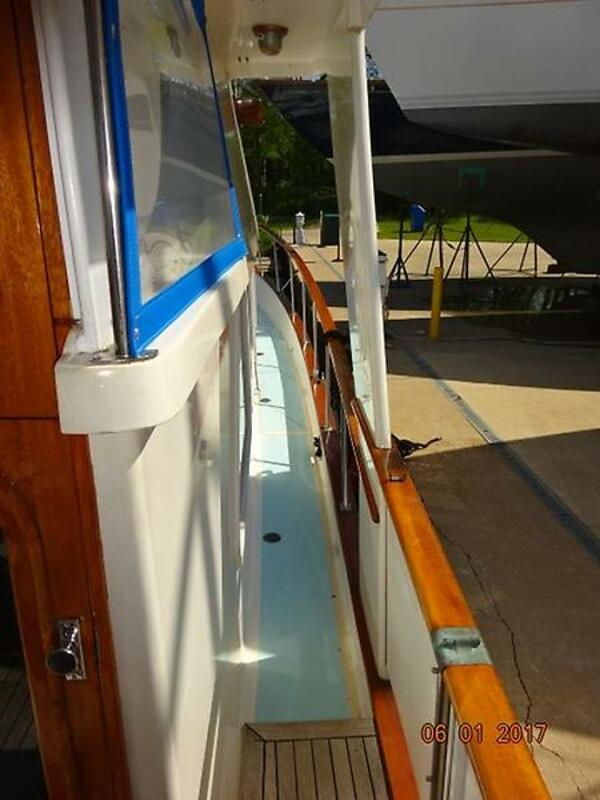 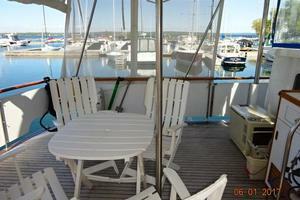 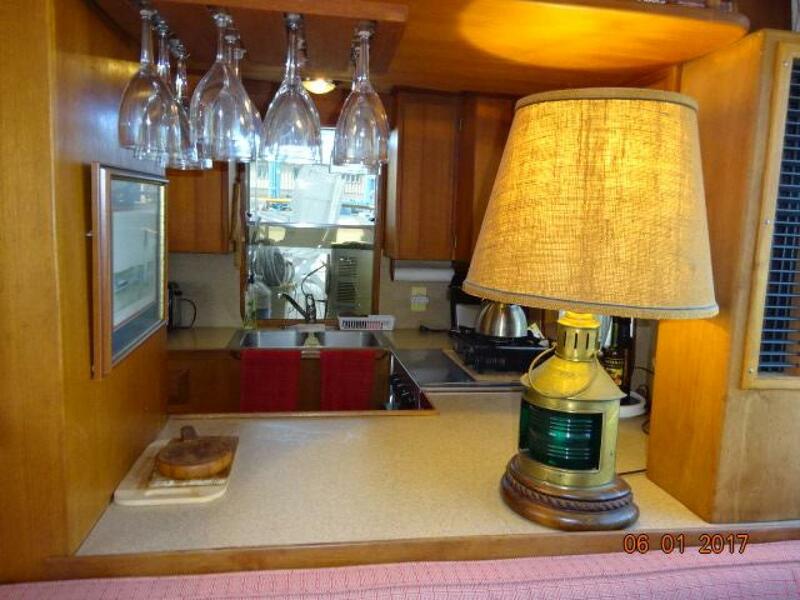 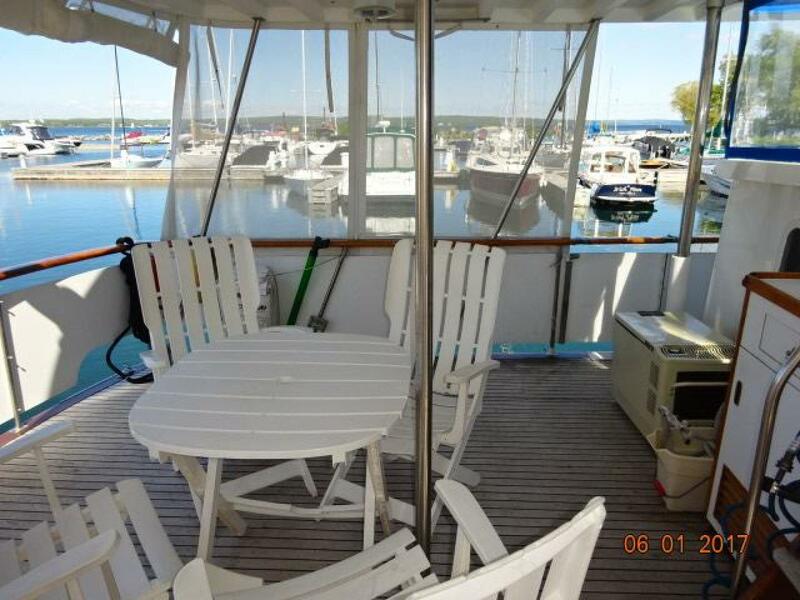 The galley is located port aft in the salon and offers a side window and aft pass-through window to the sundeck. 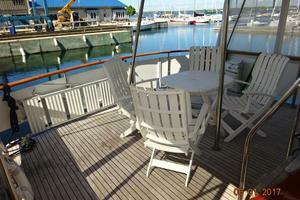 Dining space is available in the salon at the port forward built-in seating and table and at the sundeck table. 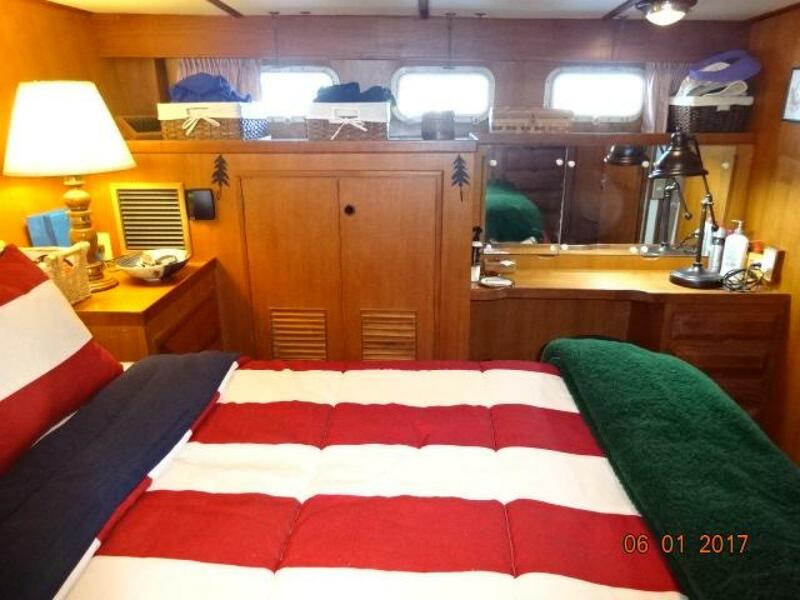 The full beam master stateroom aft offers a centerline queen size berth, reading lights, night stands, 6 portlights with curtains, storage drawers and cabinets, hanging locker, walk-in closet, vanity/desk, teak parquet sole and ensuite head with enclosed shower. 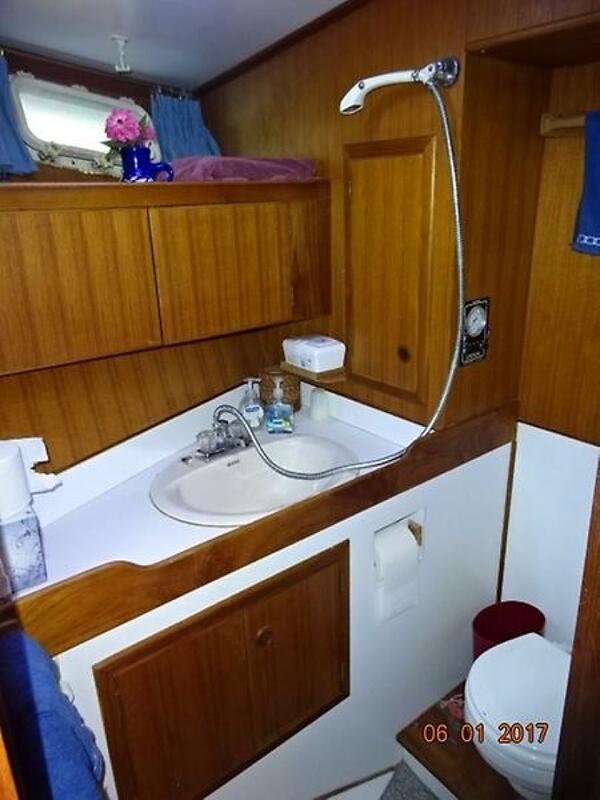 The guest stateroom forward offers a v-berth, overhead deck hatch, 4 portlights, fan, teak parquet sole, hanging locker, storage drawers, shelves, reading lights and ensuite head. 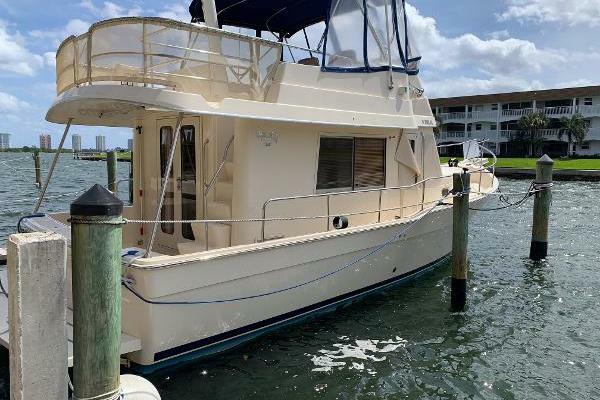 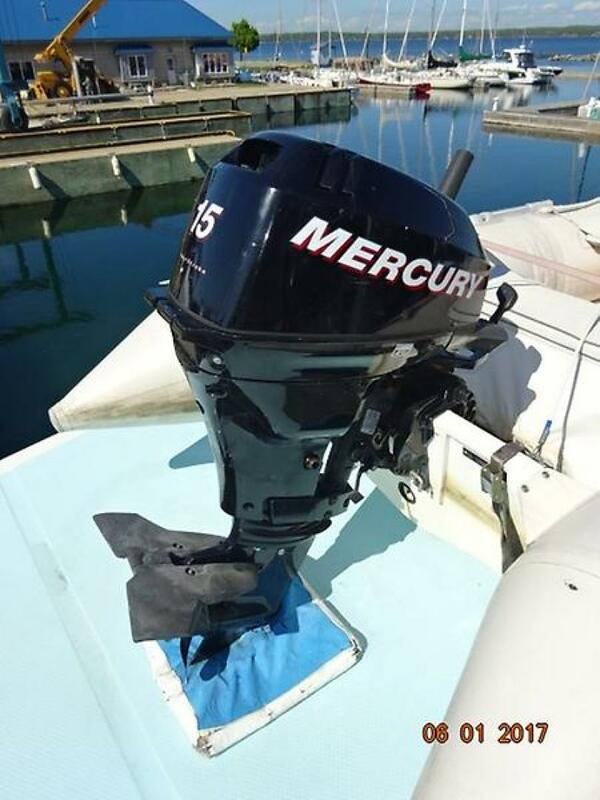 The large flybridge offers a full helm forward with storage underneath, a Pompanette helm seat, benchseats forward on each side with storage underneath, benchseat starboard aft with storage underneath, hinged mast, bimini and non-skid decks. 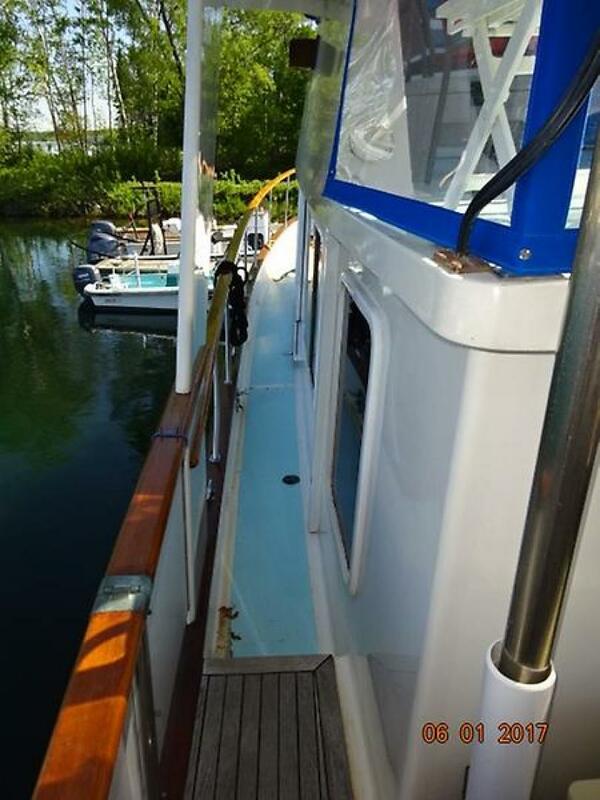 The huge sundeck offers a hardtop, teak deck, sun shades, a cabinet forward with a U-Line icemaker, rod storage, 4 deck chairs and table, side deck access and an aft access door to the teak & stainless steel ladder to the swimplatform.